anyway, the kids decided to go ultra authentic (mexican authentic, not chicago authentic) & ventured down to dia de los tamales in pilsen. i had never heard of dia de los tamales before ... but the rest of the gang here was familiar. per the website, these are "revolutionary tamales made in a chef-driven, eco-conscious kitchen." i was getting sad that i'd be left out of the fun when our intern (hi, madeline!) informed me that they have not one, but two vegan tamale offerings. day saved!! máquina verde : garlic & onion sautéed w/ garbanzo beans in a quinoa masa, topped w/ avocado hummus & sunflower seeds. spicy black bean & corn : latin infused! maybe not the most photogenic of foods, but both of these tamales were freaking delicioso. the salsas were both super spicy, so i quite enjoyed those, as well. overall, two big thumbs up. 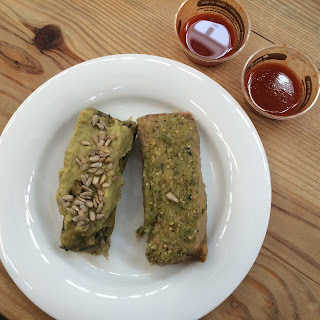 not sure if the vegan tamales rotate at all, but either way ... this place is definitely on my list of places to go back to ... asap! They also always vend at the farmer's market at Daly Plaza on Thursdays and a lot of the art fests and usually randolph street market. SO GOOD! evanston : found kitchen & social house.